Looking for cost-effective and reliable skip hire in Chigwell? Whether you are in the midst of building work or are clearing out the forgotten spare room, your local Away With It branch in Chigwell could be the perfect solution. We have offered reliable and affordable skip hire in the area for years and local residents come back to us again and again. We are full of local knowledge and therefore space, access or permit issues related to skip hire need not be an issue. Why Choose Us for Chigwell Skip Hire? We understand that customers need two things from skip hire; reliability and cost. At Away With It we understand that you need a friendly team that is able to tailor a solution to fit your requirements. Whether a commercial property or a family home, garden waste or household waste, we can help! And, if you need our help fast, we can often rush to your aid at short notice. Don’t wait for a skip to turn up, get in touch with us ASAP and save yourself from unwanted piles of waste and clutter. We are available 7 days a week between the hours of 7 am and 11.30 pm. All it takes is one phone call and a no obligation same-day quote from our friendly team to get the ball rolling. We are often able to respond rapidly, but if this does not suit you, we can liaise to pin point the perfect date and time for you. At Away With It, we take our responsibility towards the environment very seriously. Therefore, we recycle 80% of the waste we take away from a property. We are fully licenced to retrieve and dispose of waste professionally, so why settle for less than Away With It? Often when hire a skip, you pay for the whole skip, irrespective of how much space you use. At Away With It, we don’t feel this is fair on you, so with us you will only ever pay for the space on our van that you use. 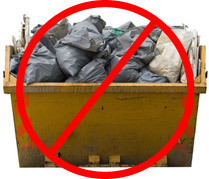 For this reason, skip hire in Chigwell with us extremely cost-effective. Furthermore, we have different services that offer flexibility to customers, whilst offering different levels of expense to suit a wide variety of budgets. We have been providing skip hire in Chigwell for years but, that is not all we offer. For those who would much prefer to relax, we can provide manned waste removal trucks. Remove some of the stress and let us deal with getting the waste from your skip to our van. Our teams also tidy up after themselves, leaving your property as if we were ever there. Not only is no heavy lifting a real bonus, and particularly helpful for our customers who are heavily pregnant or disabled, waste removal vans can often be cheaper. Get Your Quote for Skip Hire in Chigwell Now! If you haven’t used a waste removal firm before, never fear, our expert team are on the end of the phone to talk you through your options. Skip hire in Chigwell does not need to seem daunting or complicated, simply gives us a ring on 0208 504 7390 and a friendly voice will be happy to answer any questions you have. When you call us, we’ll arrange a time to visit that suits you. All our quotes are free and without obligation, and we will always provide you with the most cost-effective solution to your needs. It has never been easier or cheaper to hire a skip or get rid of that annoying waste!